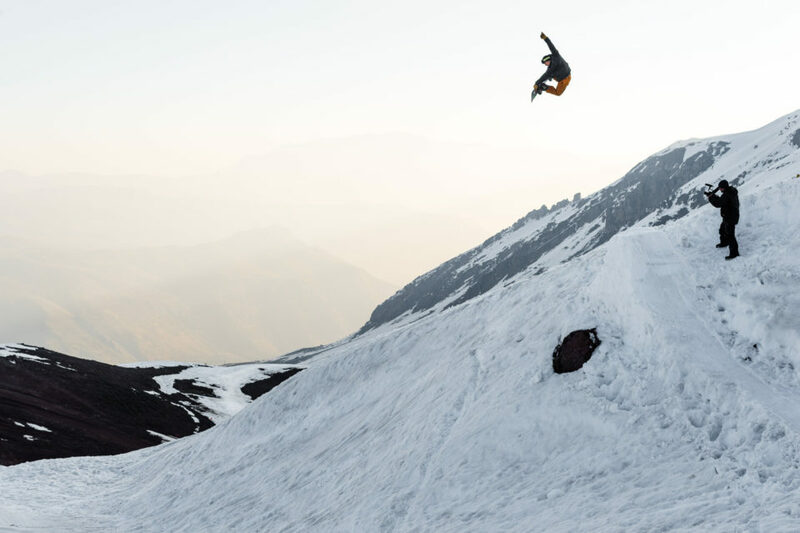 While your summer was coming to a close and you stood giddy in your living room strapped in, with winter still months away, Nicolas Müller couldn’t wait. Sights were set on deep days wherever they existed. A few phone calls later, he had a flight booked with Chilean pow royalty, Manuel Diaz, veteran cinematographer Justin Hostynek and Mervin Staff Photog Tim Zimmerman. Destination; south for snow. The first step on any shred mission is to dial in your ride. Nicolas chooses his Müllair pro model with the Bent Metal Transfer bindings. Manuel Diaz is an absolute legend in Chile. He graciously allowed us to crash at his family’s house in Santiago for two weeks, gave us a first class tour of the best side hits at Valle Nevado, El Colorado and La Parva resorts, plus drove us everywhere in this beast of a rig: complete with luxury padded roof rack. 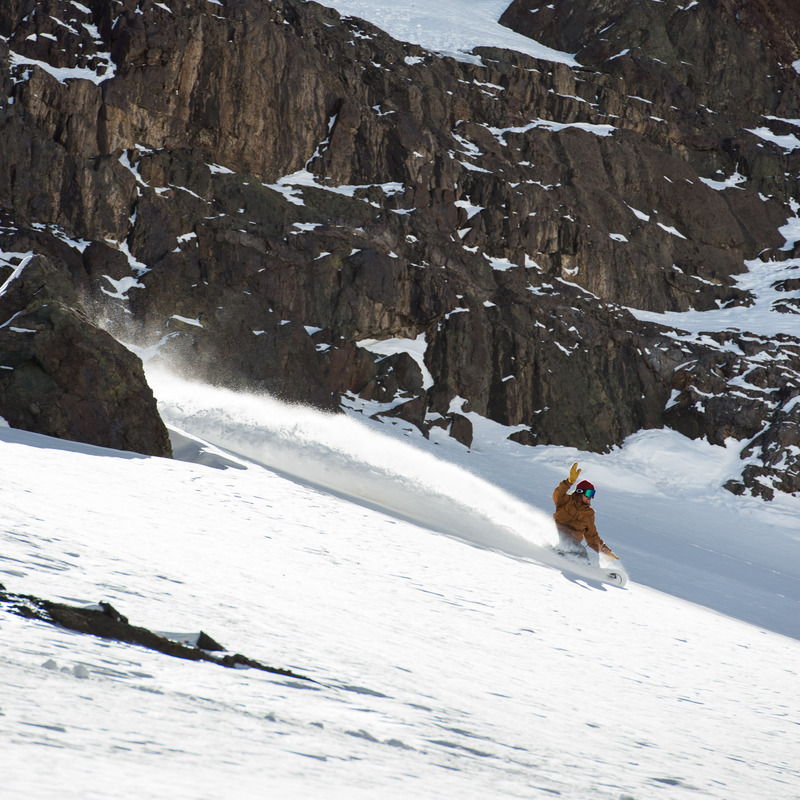 Our first move was to head Southeast of Santiago to a place called Cajon Del Maipo, where Christian Wehrhahn and his girlfriend Orion run a guided snowmobile rental operation called Dos Tiempos. They rent super powerful, modern Polaris mountain sleds, have the terrain dialed and know the best ways to get into it. Nicolas got out of the rig and went straight upside down when he saw where we were headed. Looking down the canyon from the sled drop. After climbing a few thousand feet, we found a viewpoint to check out terrain across the valley and eat some empanadas. After we figured out where to find the good pockets of soft snow, Nicolas got to work with a mini-quarterpipe tail snatcher. Dos Tiempos knew where the snow was hiding out from the warm temperatures and Nicolas unleashed his powder slashing, power buttering fury. The Andes are no joke: massive, expansive and awe inspiring. Manuel didn’t waste any time finding a spot to slash. No need to paddle into a barrel when you can just make your own: Nicolas about to self-shack. Old ice and fresh patterns. A little end-of-the-day portrait posing never hurt anyone. Nicolas, Hostynek & Manuel take it all in. Chileans take their snacks seriously. Johan the gigantic guard dog made sure no banditos made it near the spread Orion set out for us at Dos Tiempos base camp. The sun set in the valley, the wine bottles were emptied and Christian’s friends arrived to hook us up with an amazing traditional BBQ. The masterminds behind Dos Tiempos: Christian and Orion run a dialed operation! With no light pollution to get in the way, it was easy to see the Milky Way from the Dos Tiempos cabin. What’s a travel update without a couple food photos? Pulpo al Olivo – octopus in olive sauce. When is lunch? Nicolas had just gotten a new Black Magic 4k cinema camera before the trip and accidentally changed the language settings to Japanese. A quick Facetime session with everyone’s favorite Japanese spirit animal, Rip Zinger, got him back in business. After a day of chilling in Santiago we headed up to the Diaz family compound in Farellones to take advantage of the warm temps and side hits at the local resorts. Manuel’s father, Claudio has a million stories and every single one of them is amazing. The day we got to Farellones he barbequed two lambs he bought from a farmer nearby. A puma had come down from the mountain the day before with her cub to teach it how to hunt. They killed 7 lambs and left them in the field. We didn’t let them go to waste. Shred everything, including the death cookies you made when you chopped out that little quarterpipe. Some quick shovel work let us session this hip. Manuel stretched out a method while Nicolas got the poke frontside. After a quick cerveza stop, we rode this hip straight into the Chilean sunset. Many thanks to Manuel, Goñi, Dos Tiempos and the entire Diaz family for their untiring hospitality and assistance! Staff Photographer, Tim Zimmerman on a lift in Portillo, Chile shooting some photos with Nicolas Müller while he finished filming a segment for his upcoming movie Fruition.